Bunions – What Are They and What Causes Them? A bunion is an irregular bony growth on the toe located at the joint at the base of the big toe, nearest the foot. A bunionette is a smaller type of bunion that develops on the smallest (5th) toe. If you have a bunion, it may look like your big toe is pointing toward your smaller toes. This is because bunions are formed by the big toe pushing against the smaller toes, and the joint of the big toe is forced in the opposite direction. This improper positioning of the toe causes the joint to enlarge over time, which increases the crowding of the other toes. A bunion looks like a large bump on the outside of the base of the big toe. The skin around the big toe may be red and calloused. Bunions often cause pain in the foot in the area surrounding the bunion. The pain usually occurs while the person is wearing shoes or walking, and is usually relieved by rest. 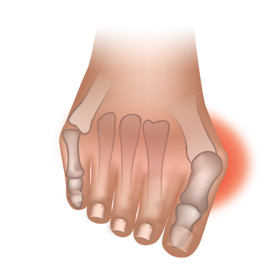 If arthritis develops in the joint where the bunion is located, the pain can be chronic. There may also be redness, swelling, and tenderness around the area of the bunion. Conditions such as gout and arthritis can cause similar symptoms as bunions. In order to diagnose bunions, a doctor will assess your symptoms and examine the anatomy of the foot. X-rays may be performed to reveal the integrity of the joints in the toes as well as to check for related conditions, such as arthritis and gout. The x-rays also help to illustrate the alignment of the toes while the patient is standing. Some people are genetically predisposed to developing bunions. Improper pronation can lead to the development of bunions. When the foot does not pronate properly, it creates instability and muscle imbalance in the foot, which can lead to development of bunions. Genetic predisposition and improper pronation are often leading factors in the development of bunions when they occur in young people. Trauma to the feet can also cause bunions. Fractures, sprains, and nerve injuries are examples of the types of foot trauma that can lead to the development of bunions. There are medical conditions that can lead to the development of bunions, as well. Certain neuromuscular disorders and variations in limb length – wherein one leg is slightly longer than the other – can all result in the formation of bunions. Bunions can also result from wearing shoes that don’t fit properly. If a shoe is too tight or the foot box of the shoe is too narrow or cramped, the toes are forced together into an unnatural position. Wearing high heels, in particular, can lead to the formation of bunions. If you already have a bunion, continue to wear high heels will exacerbate the pain associated with the bunion. Women get bunions more often than men; in fact, bunions occur 10 times more often in women. If you have an arthritic condition or a congenital abnormal formation of the bones in the foot, you are more likely to develop bunions. If you have bunions, visit Foot Solutions. We are a full service, specialized comfort footwear store (specialty shoe shop). We have a variety of products that will ease your foot pain that is caused by bunions. Your feet don’t have to hurt all the time; there are solutions that will keep you comfortable all day. Call into (Stop by) Foot Solutions to find out how we can help you with your bunion pain.